AGE: A little difficult. The heavy dark patination would be a good indication of nearly great age. However, assume a kitchen location with much smoke and grease abounding, the accumulation often accelerated the patination. My opinion, circa 1840-60, perhaps a little later. MATERIALS: The wood, where visible appears to be all of one specie, namely poplar. The metal drawer pulls, as found are not all identical. Three are brass and five are iron. The score being 5 to 3, I think the iron ones win the originality contest. Also, the three brass ones are finger tight. They are also period, however the brass are are made from two pieces capping an iron screw, definitely an old laborious method. CONSTRUCTION: Made to last like good furniture. The six horizontals between the top and bottom are mortised into the three verticals nailed at the side pieces. The top and bottom pieces have four nails to each vertical piece. Twelve equally spaced nails afix the back piece to the pigeon hole frame. The point being that the whole unit is as tight as the day it was made and will undoubtably be as sturdy for double its age or . . . ? Definitely not for a "disposable" society. The door fronts are rabbeted to hold the side pieces which in turn have been grooved to accept the bottoms. The bottoms also fit into a like groove in the front and the back. There is some slight side to side movement due to cross grain shrinkage but not enough to leave a gap. Eight nails fasten the two drawer sides to the front and back nicely. The fronts are about 7/32" thick. FINISH: It would appear the initial finish was probably a gold shellac. Subsequently a coat of varnish was applied leaving an alligatored result. This certainly testifies to its age also. DESIGN FEATURES: Around each knob are two concentric rings . . . each ring has a rounded surface. The inner one's depth is about 1/8" deeper than the outer, leaving a space for fingers to readily grasp the knob. My first choice in answering how these were created would be a die hammered into soaked or steamed material as done with the maple impressed "bread" plates. The inner ring appears to have been black painted, the outer being a soft red. 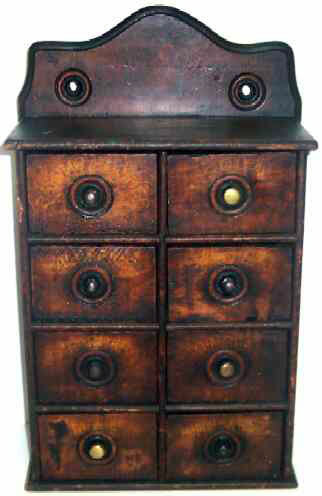 The same is true of the back top which has two of the same design around the piercings for hanging the cabinet. There is no evidence of wear at the top of the holes so it must have sat against a wall. 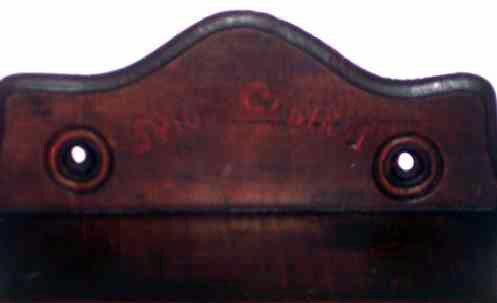 The lighter patination on the back would also support this conclusion. The molded edge around the back starting at the bottom is a nice design feature also. You can also see the spice drawers were named in an original yellow paint and "Spice Cabinet" in Red across the top of the piece. The apparent loss of some of this painting is not actual. Rather, it is caused by the heavier dark patina over some areas. Size is 16-1/2" high x 10-1/4" wide and 5" deep. Enuf said The results of the piece s long and well loved life and proud original construction is a wonderful Spice Cabinet . . . "CLOVES, BAKING POWDER, ALLSPICE, SODA, PEPPER, GINGER, MACE and CINNAMON" . . . That s a lot of "Bams" for Emeril. This is a treen relic you could never cease to love . . . Enjoy!